Discussion in 'Site Feedback & News' started by Mick West, Jul 25, 2013. To prevent bunk from forming and spreading. The specific form of bunk focussed on at Metabunk is claims of evidence. i.e. individual points that are used to back up a broader theory. For example, the fact that high levels of aluminum are sometimes found in rainwater is used as evidence for the "chemtrails" theory. Demonstrating that the evidence does not support the theory (e.g. aluminum is expected in rainwater because of dust in the air). In some cases the "theory" might simply be "something really strange is going on". You can debunk that just by explaining possible normal explanations for the evidence. Describe what the claim of evidence is, who made it, where they made it, what the known facts are, what are the disputed facts, and what is the broader theory that this claim is supporting. Link and Quote the claim. Use [EX]...[/EX] tags. Debunk it if possible. Explain what the problems with the claim are - both evidence and conclusions. Link to other sites that discuss the claim. Videos must be accompanied by a description of the video, identifying the claim made in it, with time location if longer than 1 minute. See the Link Policy. Links must be accompanied by an excerpt from the link, and/or a focussed description of what is being linked to. Not just a "this is interesting" line. See the No Click Policy. Don't just post something and say "what do you guys think?". Don't Post Debunked Bunk - Check first to see if something has been debunked. Don't post it unless you can counter the debunks. Back it up - with links and quotes from reliable source. Be honest - Just go where the facts take you. Don't try to frame something towards a particular point of view. Be Concise. Do not write long rambling posts with multiple asides. Focus on a single claim. Don't Paraphrase. If you want to say what someone said, then quote them exactly. Do not paraphrase what they said. Don't hint or give "clues". Speak plainly. Don't make people guess what you mean. Avoid Promoting Bunk. Don't post links to something unless it's being taken seriously by people open to reason. Very marginal claims are best ignored - don't give them traffic. Be sensitive. Don't post photos of dead, injured, or grieving people unless there's a good reason. Imagine they were your relative, how would you feel about their photo being posted in this context? Use English. This is an English language site. Do not use other languages unless needed while discussing the translation of something. Avoid Humor and Sarcasm. Everyone likes a chuckle, but not everyone recognizes humor. It gets in the way of communication. Just say what you mean. The "Meta" exemption - threads and posts may be about a subject if they are not promoting or debunking any claims of evidence, but instead discussing it at a meta level - why people believe, why they are resistant to debunking, why bunk spreads, how best to address it, problems the bunk might cause. Metadebunking. Regarding #1 (Focus), threads may be about a broader subject only if they discuss multiple specific claims of evidence regarding that subject. Threads based on hearsay or pure speculation will be deleted. It's about claims of evidence. Major Incident Threads - following a major incident such as a mass shooting, large plane crash, or terrorist attack, a general discussion thread may be set up immediately after the incident to discuss it, and (optionally) to discuss conspiracy theories that spring up regarding the incident. Subsequent threads on the topic should conform to posting guidelines regarding specific claims of evidence. AGENDA 21 - Not Here And Not A Concern, Right? 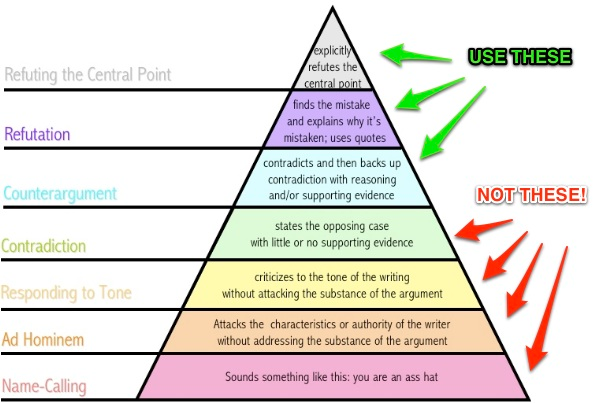 The above does not strictly apply to threads in MetaDebunking, Site Feedback, and Chitchat, which need only have subject matter that pertains to those particular forums. There's also some more leeway in the Contrails and Chemtrails forum for "meta" discussion specific to the chemtrail theory, and just interesting contrail science. Stay on topic - if there's a new claim of evidence, then it should go in a new thread. Deleting Threads - If a thread is not about debunking, or about a specific claim of evidence, it may be deleted. Splitting threads - if a new topic arises, it will be moved into a new thread. Deleting Posts - if a post is off-topic, impolite, or does not contribute constructively, then it may be deleted. Editing Posts - Material in a post that does not contribute (such as personal characterizations, or observations on how little the government can be trusted) will be removed. Moving threads to "Rambles" - If a thread does not conform to these thread guidelines, or if it goes totally off track, then it may be moved to the less visible "Rambles" forum. No it's not. There are thousands of other places you can go on the internet to state your opinion, or to release information. Nothing at all is stopping you from starting your own blog, or posting videos to YouTube. Nobody is restricting your freedom of expression. Nobody is suppressing information. If you choose to post here, then you agree that your work is subject to these guidelines, and to the enforcement of those guidelines. A free forum with no rules, guidelines, and enforcement is nothing special. Metabunk has these rules and guidelines, and this makes Metabunk a unique place where people come for specific reasons. I've updated the above slightly to clarify what Metabunk is about. It's about finding bunk, and about debunking that bunk. It's also about discussing the topic of debunking. Metabunk is not a general discussion forum for speculative theories. It's about finding claims of evidence that are wrong, and then debunking them. So, posting new threads along the lines of "The Queen is a Lizard, watch this video" will result in the thread being deleted. Threads like "Do you think there will be a false flag attack at the Super Bowl?" will be deleted. Threads like "New evidence of Nuclear Demolition of the World Trade Center" will be deleted. Threads like "Satanic symbols in the Ikea catalog" will be deleted. If you can't identify a claim of evidence, or it's not about debunking, then do not post it.